We finally had a Saturday where the weather was beautiful. At least it was beautiful until right before dinner time. The skies opened up in the evening. 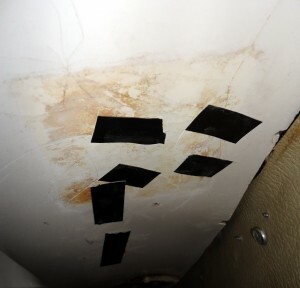 At least the boat seems to be keeping the rain out of the cabin – it is a small step – but having the top of the boat keep water out is not as important as the bottom keeping the water out. I’ll have to wait until next year to confirm that. The boys had soccer in the morning. Will’s team played better than they have all season, and they tied 2-2. Ben’s team is improving as well, even though they lost – something like 4-0. Ben is showing promise as a goalie – he enjoys the position and is pretty aggressive. After the game, the boys headed over to a village of inflatable bounce houses that had been set up adjacent to Ben’s soccer game as a fundraiser. It was $5 each play in the village, and they borrowed money to play. 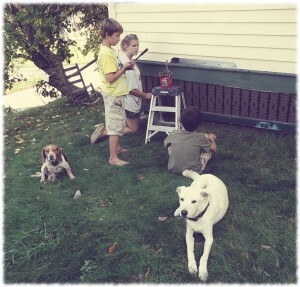 To pay off their debts, both boys spent over an hour in the afternoon helping Susanna paint trim on the porch. Hopefully the trim dried enough before the rain. I did get a little work done on the boat – epoxy repairs prior to installing the deck hardware. I epoxied the holes and will drill them out – the epoxy will keep the balsa core from getting wet if the bedding compound leaks. 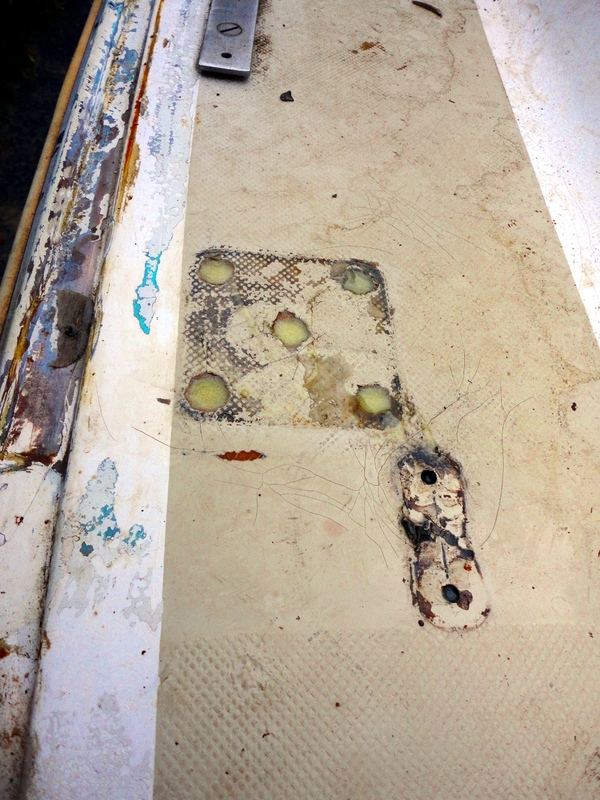 The holes filled with epoxy.. The holes taped from below to keep the epoxy from draining out of the holes..